Week seven has brought a lot of changes. Outside, the sun’s getting lower in the sky, giving us definite mornings, evenings and nights. Inside, summer staff have departed and we’re down to just the 18 who will be running the station over winter. The summer crew departed in two waves, calling for two enjoyable nights in the bar to say fair-well. Most were only on short contracts, but a few had reached the end of nearly thirty months and were very much looking forwards to the sound of rain, the colour green and other little niceties we get by without down here. Ten of us made the bumpy three hour journey back to Creek N9 to see the Shackleton depart. Her engines were already running as we popped aboard to briefly say our goodbyes - the sea had started to freeze and the Captain was eager to get moving. 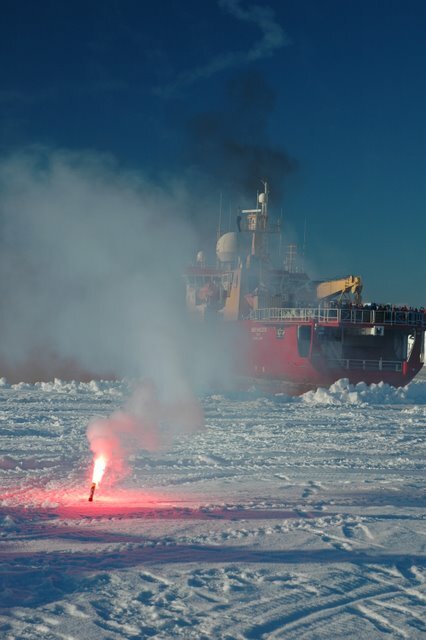 As the gangway was pulled up, we lined the ice with flares as the ship span on her axis and edged slowly away. Slipping into the mist, the Shackleton’s fog horn echoed off the ice-cliffs as sailors and Fids lined the aft decks and officers waved from the bridge. Within minutes the fireworks had burnt out and the ship had gone. For the next eight months, we're on our own. A boring question for you. What's the food like now you're established on the ice? 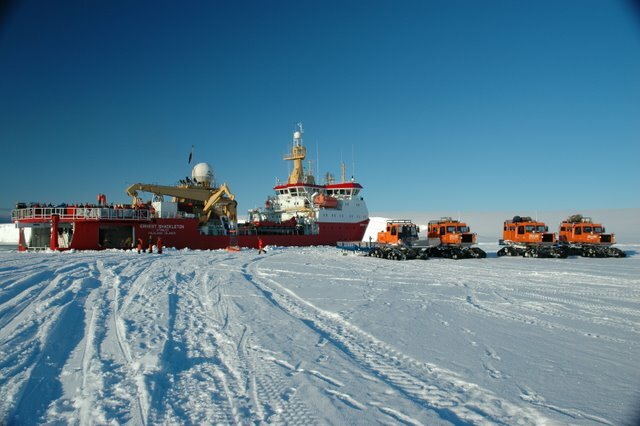 David spent a year at the Britsh Antarctic Survey's Halley research station where he took a lot of photographs. He still likes snapping but can't be arsed to get a Flickr account, so here they are! All contents of these pages, especially the photographs (except where credited to other photographers), is copyright 2006-2008 David Vaynor Evans. I know I can't stop you pinching my shots, so please play nicely and acknowledge me with a link back to this site. Oh, and post a comment to let me know what you're doing. Cheers!